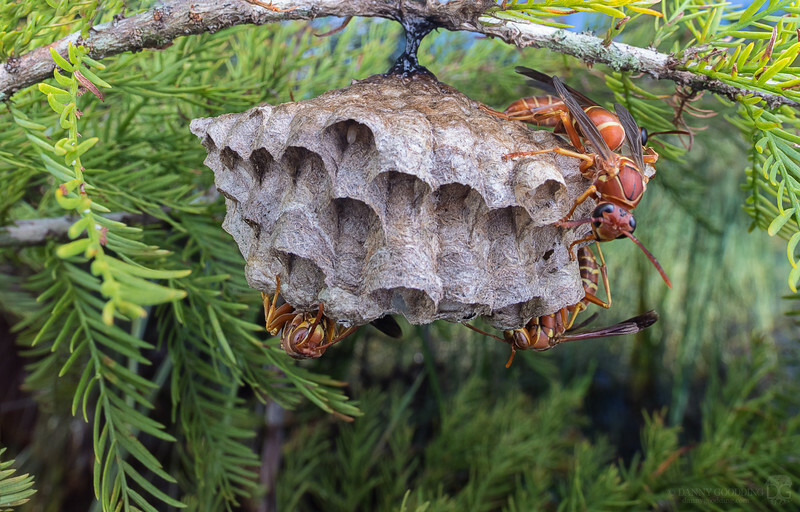 I found this nest of Polistes bellicosus (maybe P. dorsalis?) paper wasps in the field yesterday. Over multiple years of doing field work in and around swamps in Florida, I've accidentally encountered too many of these and paid for it with countless painful stings. I think that I'm now allergic to them. The last time I got stung it was by 4 at once and I got so dizzy that I passed out for about an hour when I got back to the truck, but luckily I had no respiratory issues, so I've got that going for me which is nice... Anyway, I've learned to look much more carefully when navigating around on foot or on the water. This nest was hanging a couple feet above water that was about 2 feet deep, so I slowly approached in my chest waders, knelt down, and scooted closer on my knees in the water while watching them. They never seemed alarmed by my presence. If anything, they just seemed curious, maybe at their own reflection in the lens? I should note that my flash diffuser is basically a little over 1 foot in diameter and sits around the lens, essentially acting as a shield just in case, but it turns out that didn't even matter. For these shots, and especially the closeup, my lens was easily only mere centimeters from them, but they didn't even seem bothered. I feel some sense of accomplishment that they allowed me to get so close and didn't seem disturbed at all! I just thought I'd share the little backstory behind the shots!